When it comes to Florida’s two major rail proposals–a high-speed train from Tampa to Orlando and passenger rail service from Jacksonville to Miami, possibly with a stop in Bunnell–John Mica is hopping on Gov. Rick Scott’s bandwagon: no state money for either. If Floridians want the lines, private companies will have to match what federal funds are provided. That, in essence, is the likeliest way to kill both projects. Florida last year received $2.4 billion in federal stimulus dollars to build the Tampa-Orlando link. Some $342 million of that was extra–money redirected to Florida when Ohio and Wisconsin dropped their plans to build high-speed rail lines. But Gov. Rick Scott is opposed to the idea. His opposition is based on a white paper by the Reason Foundation, a libertarian think tank, that analyzed Florida’s project in light of other mass-transit rail projects and concluded that costs are underestimated on nine out of every 10 large passenger rail transportation projects, with cost overruns averaging 45 percent higher than anticipated. But the Reason Foundation’s premise is faulty. It was based on two Europeans’ analysis focusing particularly on three European megaprojects–the Channel Tunnel, the Great Belt Link, an immense bridge in Denmark, and the Oresund Link, a bridge connecting Denmark and Sweden. Those projects, the labor laws, time frames, tax subsidies, northern-latitude weather extremes and other factors, have little to nothing in common with high-speed rail in Florida. Nevertheless, based on that paper, which projected potential overruns of 45 percent, or $1.2 billion, Scott said he’d base further developments of the line on “feasibility,” and on whether private bidders would be interested in shouldering the cost. Earlier this week, John Mica, the Republican congressman who represents Flagler County and now chairs the powerful House Transportation Committee, allied himself with Scott’s position. At a Florida Statewide Passenger Rail Commission meeting in Jacksonville on Tuesday, Mica said whatever additional dollars are needed for the $2.7 billion high-speed rail line should come from private interests, not the state. No private company or consortium is likely to put up $300 million or more in a state whose leading transportation and government officials consider mass-transit projects either low priority or unworthy of wider public support. Mica was equally dismissive of the Jacksonville-Miami rail line, which has particular interest in Flagler County, if it is not “economically viable,” he said. That’s a different way of saying that the line must support itself if it is ever to be financed. But ail systems never support themselves entirely anywhere in the world: they’re subsidized to some extent by government, in exchange for the wide public benefit they provide: reduced congestion, reduced pollution, reduced energy consumption, reduced impacts on the environment, more efficient transportation, broader access to transportation for many who don’t have vehicles, and so on. Mass transportation systems, in other words, are by definition partly subsidized because of their public benefit. In 2009, Amtrak took in $2.35 billion in total revenue against $3.5 billion in expenses. The federal government subsidized the remaining $1.49 billion. That’s not how Mica or Scott see it. On Tuesday, Mica referred derisively to Amtrak as a Soviet-style train system, although Western Europe’s rail system is far more heavily subsidized (and far more extensive, and therefore used) than America’s. The Jacksonville-Miami rail line is in place, but to be viable as a passenger line, it needs some $250 million in upgrades, including several new stops along the way. None of that money is available. 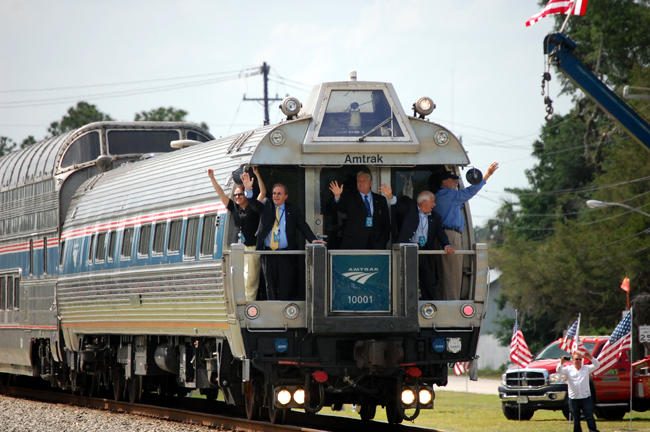 Florida transportation officials applied and failed to get federal stimulus dollars for the Jacksonville-Miami line, which would run Amtrak trains on the Florida East Coast rail line, a passenger service that ended in 1968. It had stopped in Bunnell and many other coastal cities in Florida. State transportation officials hope to tap half of it from the state’s transportation trust fund. But to do so, they’d have to overcome several political and financial hurdles: the state is facing a $3.5 billion deficit this year. Trust funds have been a favored target of legislators to plug holes, not to invest in new projects. And Scott is still talking about additional tax cuts, which would widen the gap further. Politically, the transportation department’s hopes are out of sync with Tallahassee realities. The state is also hoping to get half the cost in federal matching funds. That, too, may prove difficult, even with Mica at the helm of the transportation committee, because Mica is not making the Amtrak-Jacksonville line one of his priorities. As chairman, he has wide powers to appropriate money for pet projects, but he is far likelier to use that power to benefit his district, and his electoral chances, than to spread the money around on a rail line that only fractionally covers his district–and connects two Democratic hubs in Florida (Jacksonville and Miami). Floridians may be eager to travel from Jacksonville to Miami in six hours, without pressing any gas pedals. Bunnell has scouted a new train station location. So has St. Augustine. But chances are that any talk of a revived rail line (or a high-speed line between Orlando and Tampa) will be just that for the next few years: talk. Thank you governor and congressman. At last — someone more interested in us than in showboating and pandering to the unions. The railroad along the most trafficked and loony liberal area of the country (Boston/NY/DC) can’t make money, so why would any thinking person believe one from JAX/Bunnell/Miami can come anywhere near paying for itself. Another lefty pipe dream that needs to quickly be put out of its misery. It always amazes me when people use the argument that “rail doesn’t pay for itself” therefore it’s not a good investment. Which method of transpiration does pay for itself??? Highways? Commercial Air travel? Bus? All are heavily subsidized by Federal and State governments! Why is it that rail must be the sole transport model that has to be self sustaining? I disagree. If there were a rail to Miami from Bunnell and it was not too expensive, I would travel to Miami more often. I love going down there for shows, dining, shopping, etc… But the drive is too much and I don’t want to pay for the gas. I think that the rail along th east coast could help to spur our tourist industry and get people to visit more places in the state outside of the major cities. The problem is not that rail needs to pay for itself — and without the Interstate Highway System, shipping prices would be exponentially more — it is that, in the South, and West, and primarily anywhere outside the top 20 metropolitan areas, rail transportation is an economic disaster. It is similar to mass transit, the editor of FlaglerLive has referenced the New York Subway 7 line, and his experiences riding it. But, that system serves a population in a way that a train system in the south cannot. I could not walk from my home to the train station, so it couldn’t replace a car, even if it I could get a ride for the seven, or so, miles from my home to the Bunnell station, how would I get from the station in Jacksonville to my school, in Jacksonville — without hiring a cab, when was the last time you saw the rates for those in Florida, it be like buying $3.15 gas to pour on the ground. The metro- subway/commuter trains operating in major cities are great for them, but it would be an drain on our tax-base. The rail-like commuter system in Jacksonville is a prime example, when you compute the costs — per rider, per ride — it costs over $600 — yet, you only have to put $0.35 in the machine to get on, so it pays you to ride. Johnny tax Payer: where do you get your information, Amtrak, bus systems would go broke if not for goverment support, I don’t think Delta or US Air are in the same boat.. Highways are paid for in part by our tax on gas Very few tax payers want this system, it is not a high speed system and the state will be stuck paying for it after the federal goverment pulls out. Give it to private industry if we want it.. The average American is not going to give up their car, no matter what. I would love to ride on the train from Bunnell to Miami, but not at the expense of our schools, state budget, etc. I hope that this idea will come back again when we are more flush. Florida is a state of hillbillies, run by corrupt politicians. I guarantee you if Gov Fraud Scott could enrich himself or his ruling class of elites there would be trains everywhere. France recently tested a train that goes over 500 mph, our trains chug along at 50 mph. In our race to the bottom we are falling so far behind the rest of the world it’s going to take a 100 years to catch up. Anti intellectual republican conservative teabaggers are a cancer on this nation. Has Gov. Scott indicated what he plans to do with the $2.4 billion in stimulus money he received from the Federal Government last year for the rail project? Any odds on his giving the money back? Anita: if he does give it back the crooks in Washington will just find another wasteful project to spend it on, maybe they can bail New York out, let it go broke is my vote. What’s all this about rail lines needing to make money? No highways make money, not one of them. We spend billions to fix and widen and rebuild Interstates, State Roads, County Roads and local roads each year and they make $0 a year. Why no money for mass transit then? Anita, much of the money has been spent clearing the way for the Tampa-Orlando line. I wonder if a cost analysis has been done by the brainless people who run this state. I note that this morning I-4 was blocked by numerous traffic accidents. The cost of the fatalities, injuries, lost work time, idling engines, rescue workers, law enforcement, etc that could be avoided by completing the project would figure into the analysis. Train travel is ten times safer than car travel. There would also be increased property values as people buy homes near the train line. That means more tax revenue flowing into the state. The tourist industry would rebound as visitors, many from more advanced countries that have hi-speed rail lines would be able to get around in same the manner that they do at home. Would the train line be profitable? Maybe not, but neither is road maintenance and construction. People who advocate local public transportation or dependence on trains and buses for longer trips have never experienced the inconvenience of it. Commuters in affluent areas like the bedroom towns around Manhattan, need an extra car to leave at the train station and even though the commuter lines don’t pay for themselves (thanks in large part to the multitudinous unions involved), commuting is still very expensive, crowded and uncomfortable. I’ve been on those high speed trains in France and they are fast, but Europe isn’t the U.S. We are far too big and too spread out to make them feasible. Ford did us all an immense favor by making his cars accessible to us all and Eisenhower’s system of interstate highways freed us to come and go as we please. Individual freedom — the great buckaboo of the collectivists. As for Ford, he did this country a great disservice by bringing an end to laying train tracks in order to increase Ford’s profits and in doing so, also made this country the biggest gas guzzlers in the world. One of the problems with mass transit is it seems to become a hot bed of crime, and many who would like to use it don’t for that reason. I had a co-worker who was on the Atlanta MARTA system. A robber accosted him, had him lay face down and offered to “cap his azz” if he moved. Then, when you try to charge another quarter for that ride that actually cost 15 bucks, the users scream, the poticians capitulate, and the rest of us are forced to subsidize the criminals’ transportation to and from their victims. True….we checked into going to Atlanta from Palatka. We’d have to go to Greensboro first; then to Atlanta. Total trip time: 21 hours. Then we’d have to rent a car. It took us seven hours to drive there, and we had a car when we got there. To those who have relied on automobiles all their lives, as a former New Yorker, I have used mass transit for much of my life and have to agree with Dorothea. A “hot bed” of crime? How provincial. Don’t forget, our VP, Joe Biden commuted back and forth when he was in Congress. Among the folks I’ve had the opportunity to meet on the train were actors, educators and businessmen and women, hardly your run of the mill purse snatcher or mugger. If you think running a bullet train from France to Italy would be a a piece of cake compared to the trip from Jacksonville to Miami, you really ought to get out of your cave more. But I’d like all of you government hating, tax-phobic, seething-with-ill-will towards big cities patriots to consider the amount of petro-dollars funneling into Saudi coffers and helping to fund more madrassas teaching kids hatred of the good old USA. Think the resurgence of railroads might eat into their profits much? Got a better idea? Well, apparently Biden and Pelosi disagree on the utility of mass transit; she used a 757 to get back and forth to work. Remember, the G-IV wasn’t big enough, which illustrates another point: mass transit only makes sense in a densely populated, geographically limited area. Also, Biden and Pelosi had taxpayer funded limousines waiting for them at each end of the trip. I’m fairly certain they weren’t Priuses either. DLF; Gas tax pays a portion of highway building, but it in no way covers all of it. Air travel? Not only have we bailed out Commercial Airlines many times over, but what about the cost of operating airports, which are typically Government owned? What about the TSA? What about the NTSB? What about Air Traffic Control? Air Marshals? Sure user fees cover a portion of the expenses for these agencies, but the rest is made up by tax payer subsidies. As I said, there is no transportation system in place in our country that is self sustaining, all are subsidized by tax payers to great extents. Hell you can’t even ride your bike from your house to your neighbors without going on a sidewalk or street that has been subsidized by the tax payer. But for whatever reason Rail (by far the most efficient means of moving people and freight) must prove it’s economic independence, when all these other models don’t. The time savings on an airlines justifies the cost of a rental car; plus, it’s generally not an everyday event the one airlines. For the purposes of daily commuting, I say again, mass transit works best in densely populated, compact areas. The topic of discussion is the Tampa to Orlando train proposal. It takes about an hour or two to get between these locations. It doesn’t make sense to have to rent a car after this short trip. The bottom line is the many would be subsidizing the travel of a few. This is not the case with roads and interstates as almost everybody uses them everyday. With air travel, taxes on aviation fuel pay for the infrastructure, and ticket taxes cover the cost of security, including the TSA. What happens if after your commute from Tampa to Orlando you decide you’d like to take a quick trip to Daytona Beach? Unless there’s a plan (which would be prohibitively expensive) for a statewide system, then I don’t see the point. I am sorry stuck in Palm Coast feels that way, But one good thing , I 95 will take you there and when you exit, just don’t use the Northbound lane. Problem Solved. This way you can stay down in Miami and watch all the shows, drive on the crowded streets.Shop with all the millions of rude azzholz , You will never have to feel stuck again. !!! Good Luck with that. I lived there for most of my life, IT’S A CITY LOST NOW. USELESS , A CEMENT JUNGLE. That is why we here in Flagler County don’t want to lose the smll town feeling.